When: Saturday, November 24th. 9am to 6:30pm. Bring: Board, pieces, clock and pen if you can. Format: A four-round Swiss-System, non-elimination chess tournament (where everyone plays four rounds) It is USCF dual rated (Quick and Classical) and divided into three sections: Open, Reserve (for players rated between 1000 and 1599 or unrated) and Cadet (rated under 1000 or unrated). Time Control: 50 minutes for each player with a 10-second delay on each move. Round Times: 9:00, 11:15, 2:00, 4:15. Awards ceremony at 6:30. Half-point byes available in any rounds. Last-round byes must be arranged before the start of the second round. Prizes: Cash prizes based on entries with >70% returned. $100 minimum guaranteed first place in the Open section. State residents qualify medals for top three in each rating class: M, X, A, B, C, D, E, u1000, u800, Unrated. 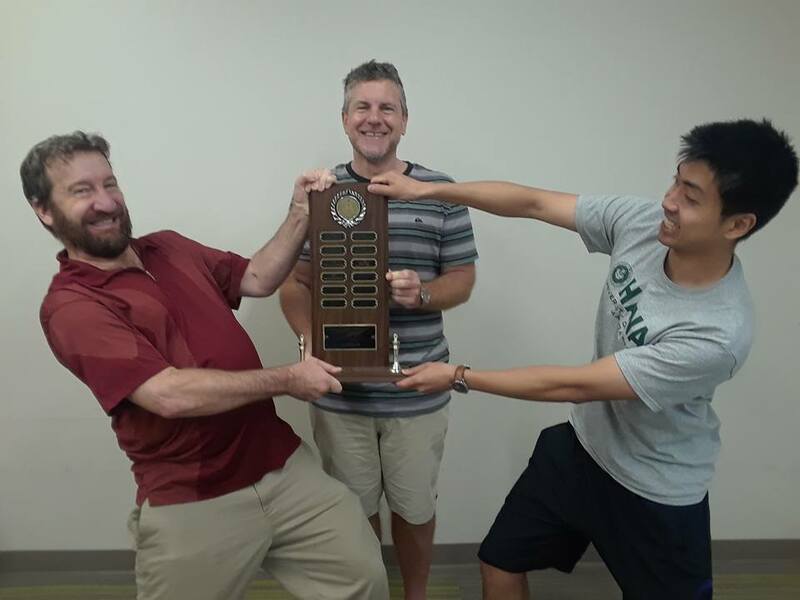 Official state chess champion class titles awarded for M, X, A, B, C, D, E.
Official Ratings: USCF official ratings from November, 2018 will be used for this event. To see the current list of Hawaii players with USCF ratings click here. Parent Tips: The Cadet section is for younger and beginner players to earn a USCF national rating. The Reserve section is for experienced teen or adult players who are unrated. 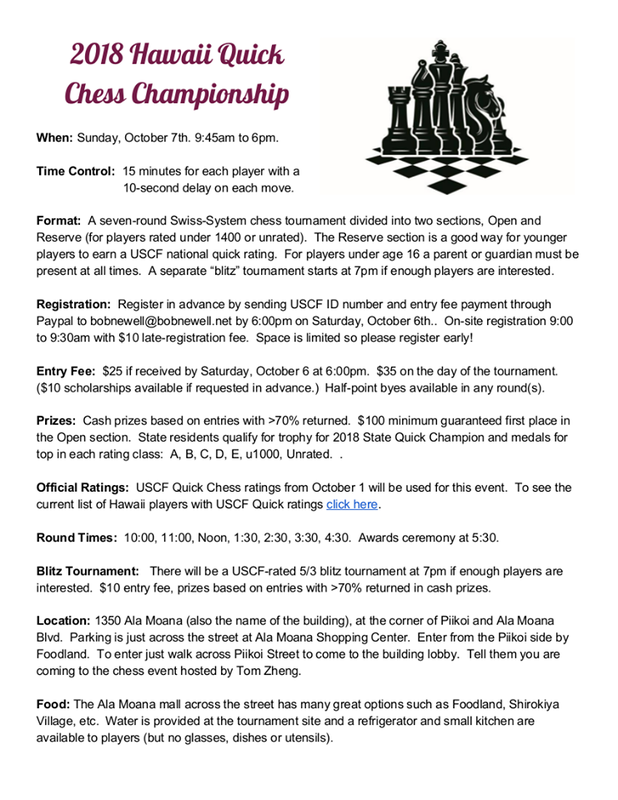 Participants must have a current USCF membership and write down all the moves. Players under age 16 must be accompanied by a guardian at all times! Directions: From the H-201 Highway take the Puuloa exit North toward Tripler Army Medical Center. At the first light turn right (East) on Mahiole St. The school is on the right side. Park in the main parking lot and follow the signs to the chess tournament in the cafeteria. Food: There are several food options at the Moanalua 99 Mall across the H-201 highway from the school. Lunch break will be approximately 45-90 minutes depending when your second game ends.